Former National Football League player and U.S. 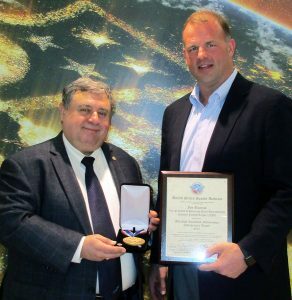 Congressman and current NFL Vice President of Football Operations Jon Runyan, right, recently was presented the United States Sports Academy’s 2017 Theodore Roosevelt Meritorious Achievement Award by Academy President and CEO Dr. T.J. Rosandich at the NFL offices in New York City. The award is presented to an individual in any amateur or professional sport, past or present, who has excelled as a contributor to both sport and society over at least a decade. DAPHNE, Ala. – Former National Football League player and U.S. Congressman and current NFL Vice President of Football Operations Jon Runyan has been presented the United States Sports Academy’s 2017 Theodore Roosevelt Meritorious Achievement Award.